This past summer, my daughter and I visited the Wizarding World of Harry Potter at Universal Studios for the first time. Somewhere between the delicious food and the amazing rides, she turned into a full-fledged Potter fan – so today, we are celebrating with an ice cold glass of Harry Potter’s Pumpkin Butterbeer! 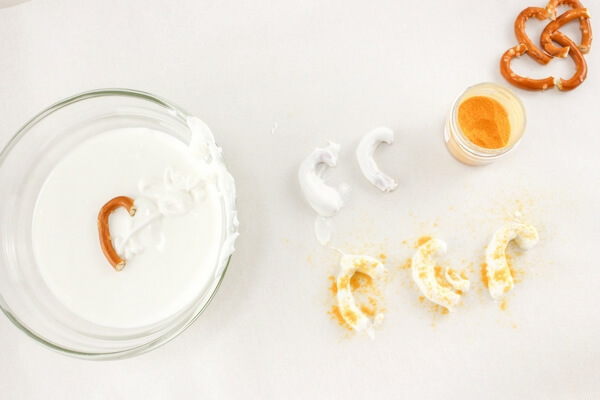 This Pumpkin Butterbeer is lip-smackingly smooth, with a unique flavor that your guests will keep sipping – trying to put their fingers on the delicious combination dancing on their tongues. 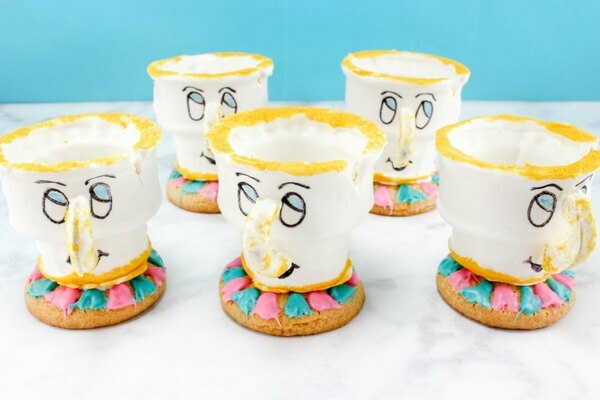 The butterbeer recipe at Universal Studios was developed by top Florida chefs and is top-secret so trying to recreate one from memory was a fun experiment for my daughter and I to take on. It was like we were hosting our very own potions lab, with lots of stirring, sipping and experimentation! 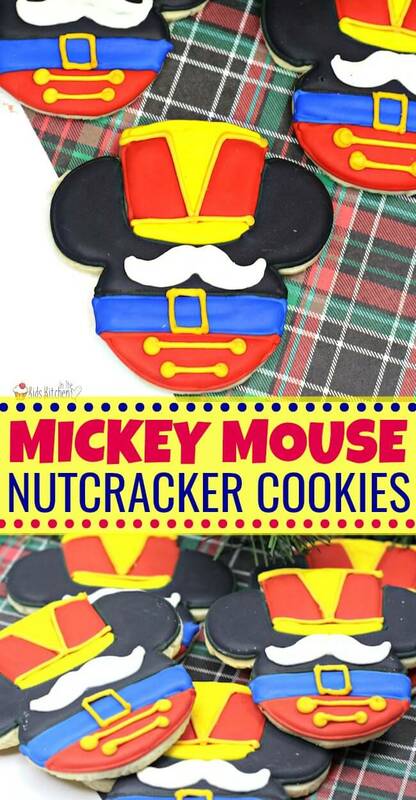 While I think the version at Universal Studios doesn’t have apple cider or pumpkin, we really liked our version and it almost seemed more authentic to the original books to include those fall flavors. 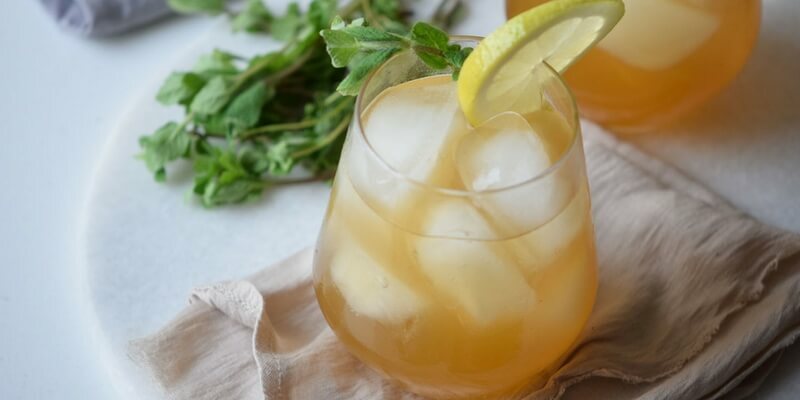 Of course, you can leave out the pumpkin puree – it just adds an earthiness and helps mellow out the sweet flavor – or even the apple cider, which I think makes the drink even more refreshing. 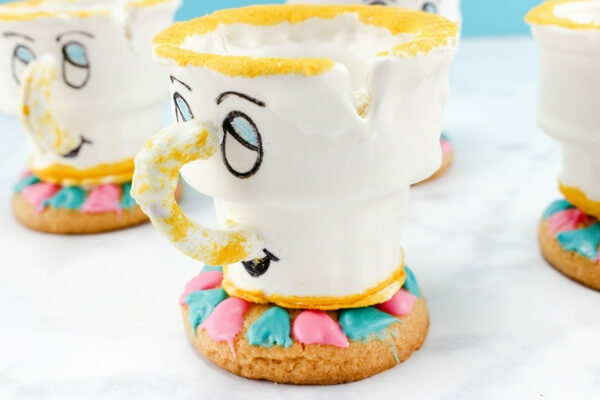 This copycat Pumpkin Butterbeer is delicious, whether served hot or cold, and you can top it with a bit of whipped cream if you desire. 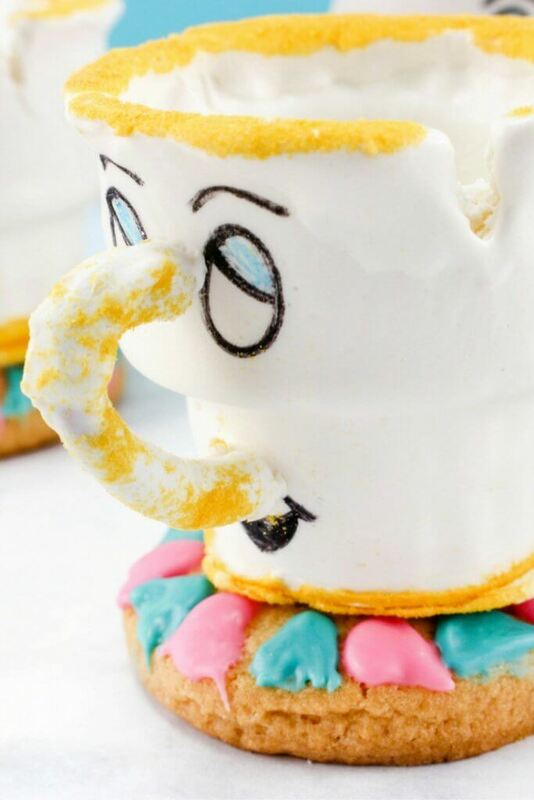 The whipped cream at the Wizarding World of Harry Potter seems to have some caramel or butterscotch topping whipped in for a sweeter flavor so definitely give that a try if you’re going to go the extra step. 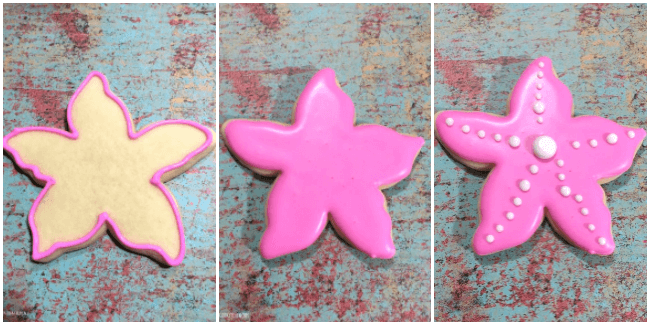 Either way, you’re in for a magical treat! Tip: Our pumpkin butterbeer can be served hot or cold. 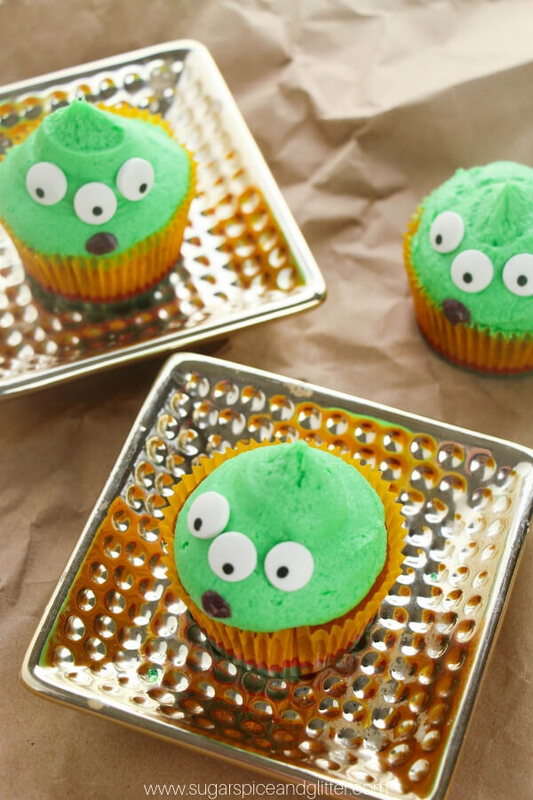 In a medium saucepan add your pumpkin puree, cream soda, and imitation butter and cook on medium until well combined. Top with whip cream, if desired. 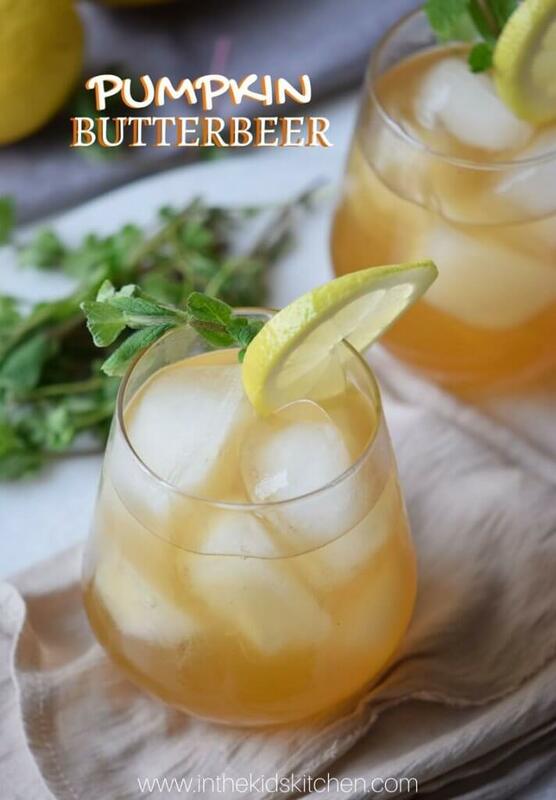 Pin this Pumpkin Butterbeer for your next family movie night! 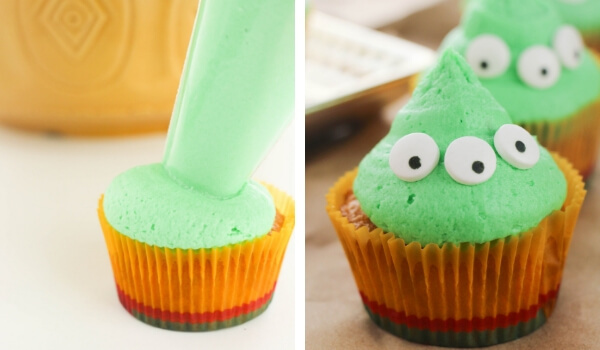 Do you have some Harry Potter fans in your home? 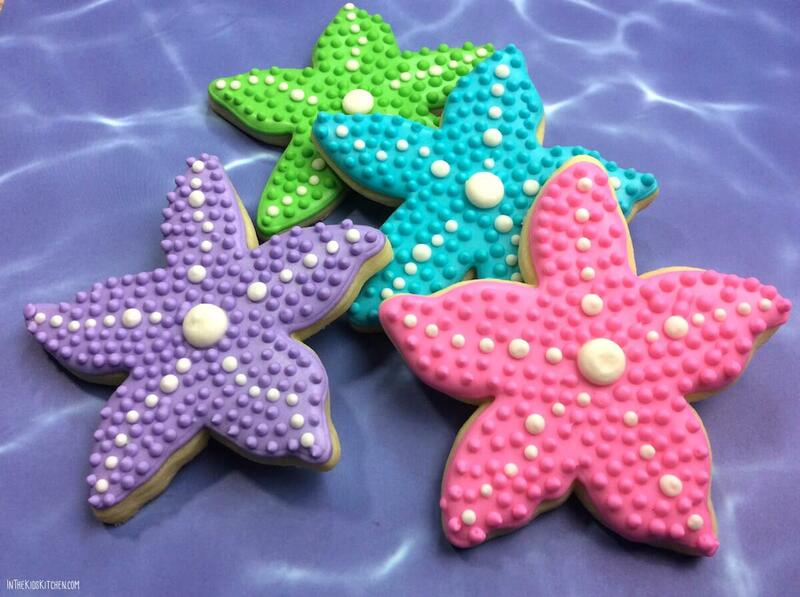 What is your favorite treat from the book that you’d like to see us recreate? 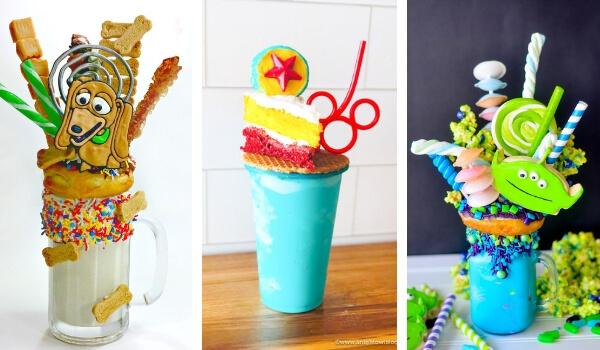 For more delicious movie-inspired treats, check out our Moana Hawaiian Punch recipe or our Cars Rice Krispies Treats recipe. 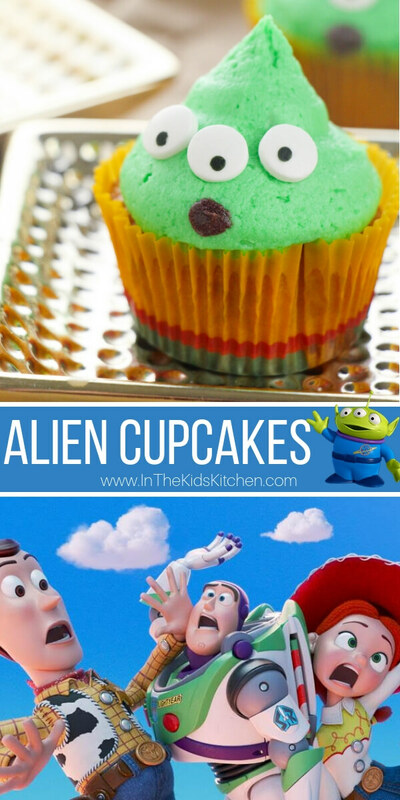 The ultimate collection of Disney recipes for kids! 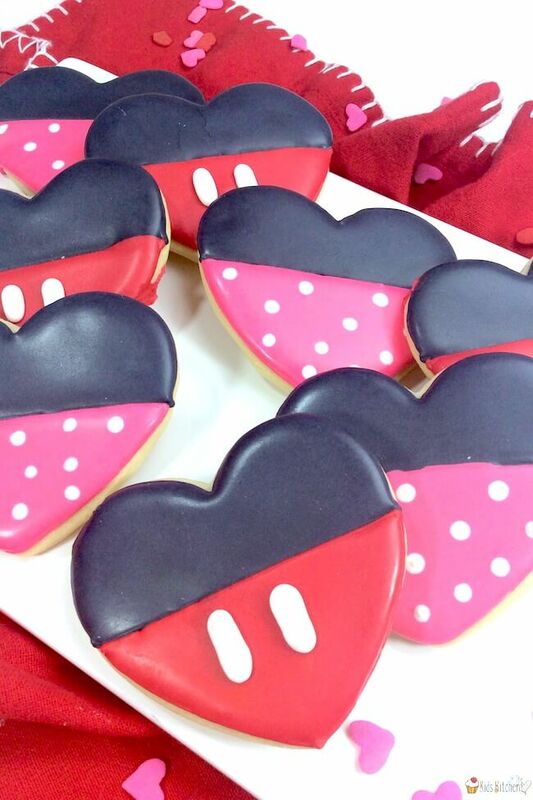 We love all things Disney!! 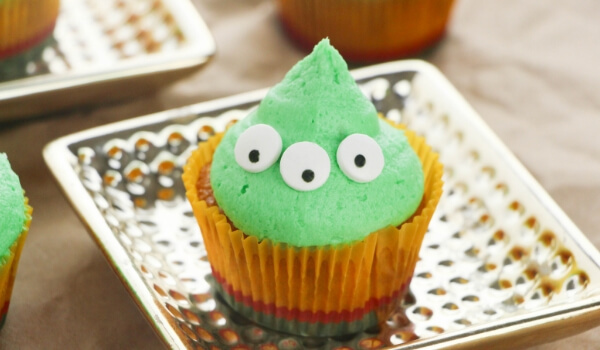 So of course we had to put together a collection of our absolute favorite Disney Recipes for kids! 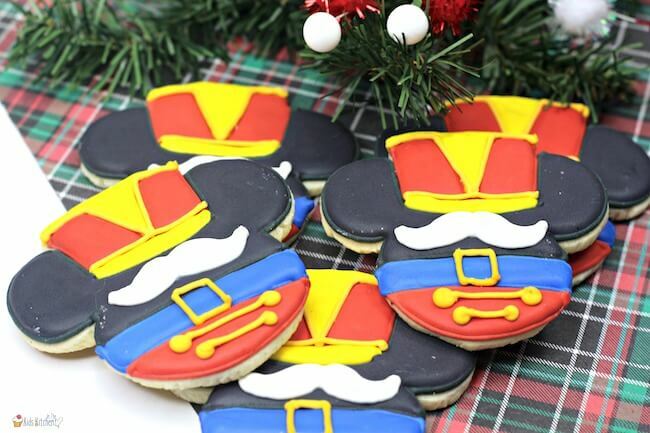 Lions and pirates and more…oh my! 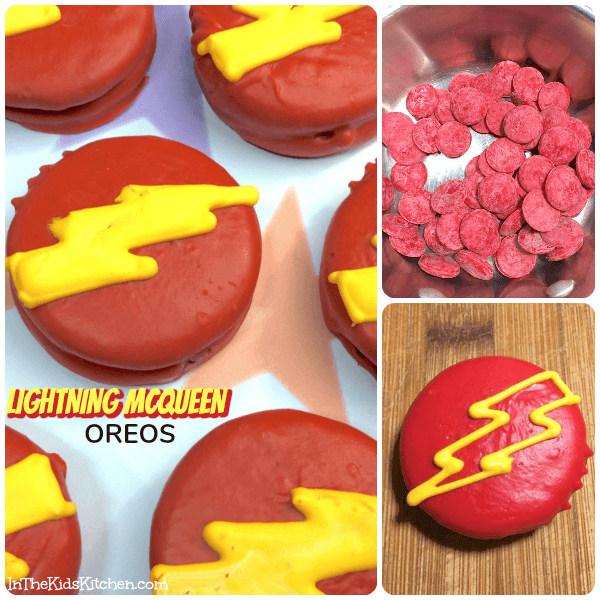 If you have a Cars fan in your house, then these colorful Lightning McQueen Oreos are a guaranteed hit! 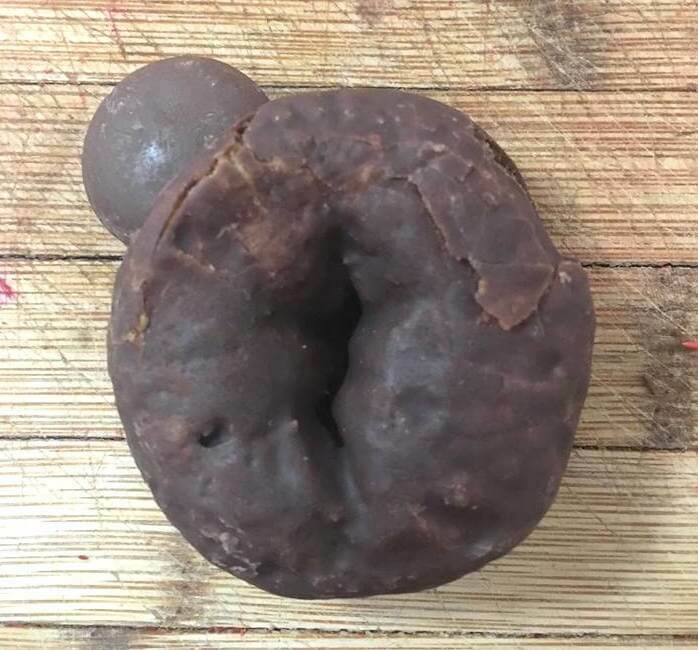 We love making chocolate covered Oreos because they’re a quick and easy treat that kids can help make. (My girls especially love the dipping process). 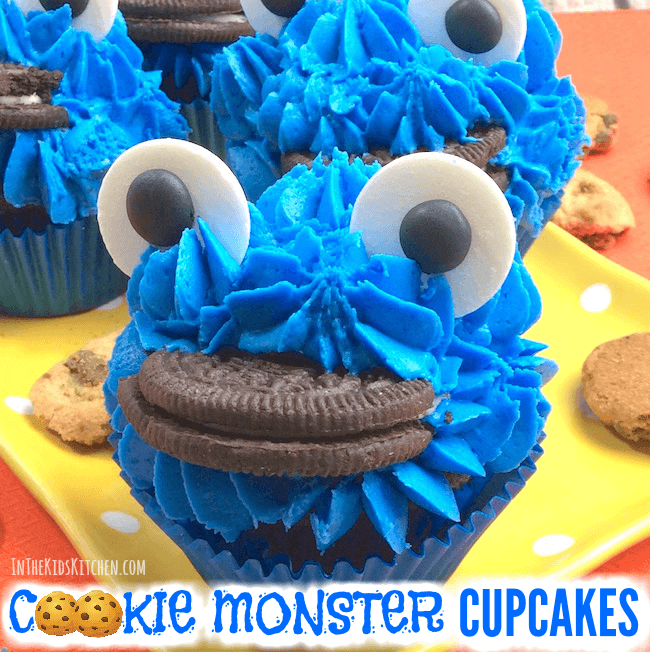 Plus, Oreos are super tasty! 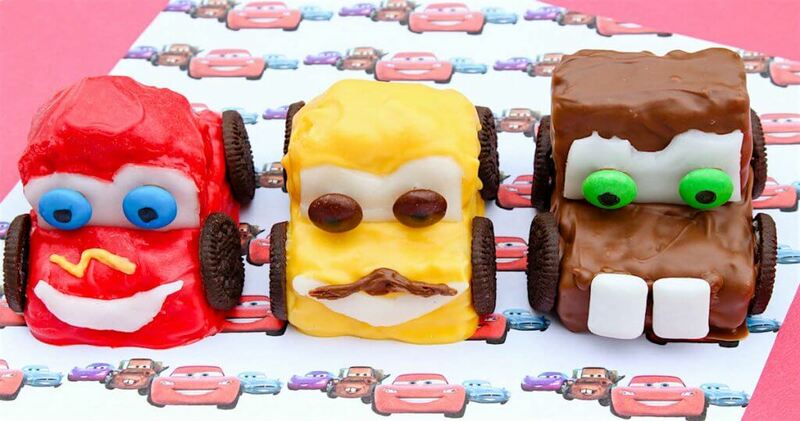 These Cars-inspired Oreo cookies are perfect for a Cars birthday party, lunchbox treat, or just for fun! Affiliate links are provided for your convenience; disclosure policy available here. Add water into the bottom pot of a double boiler. Tip: You can create the same double boiler effect using a saucepan with a metal bowl on top. Parents, please handle this step for your kids and remember that both the pot and bowl will be extremely hot. Once water in bottom pot is simmering, add the red candy melts into the top pot or bowl. 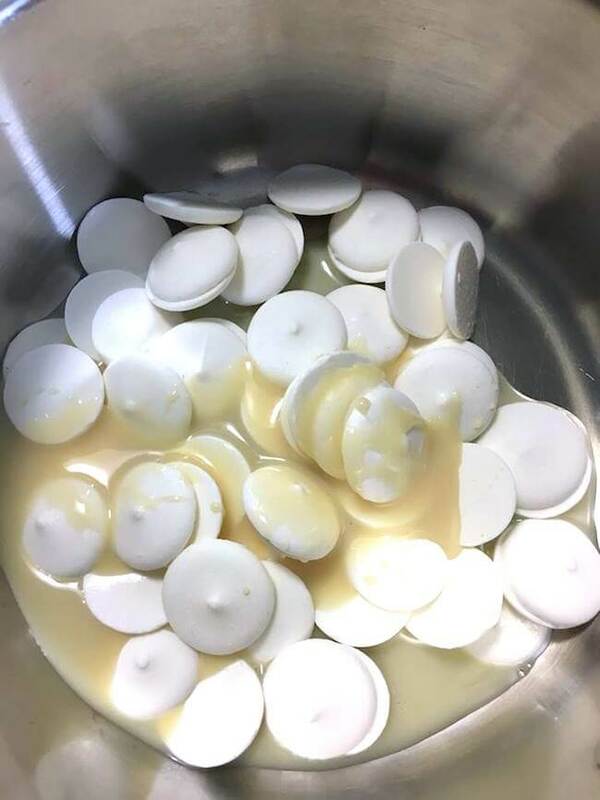 Stir gently to make sure candy melts evenly. Once red chocolate is melted, it’s time to dip your Oreo cookies. 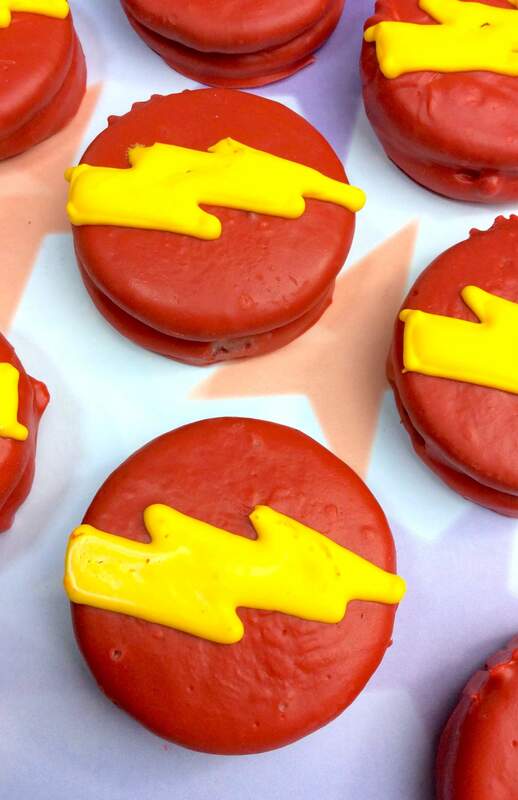 Place an Oreo in the melted red candy and turn with a fork to coat the entire surface. 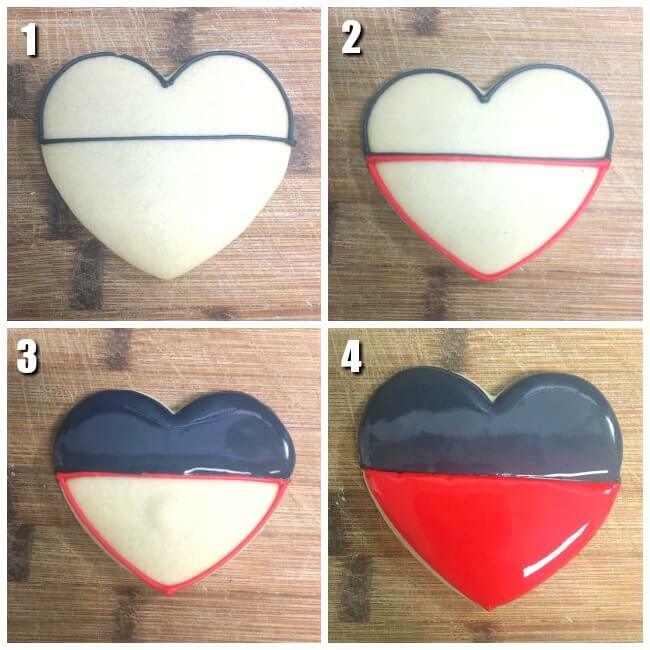 Remove cookie from chocolate, allowing excess chocolate to drip back into the bowl, and place on cookie sheet. Tip: Chopsticks also work very well for the candy coating process. 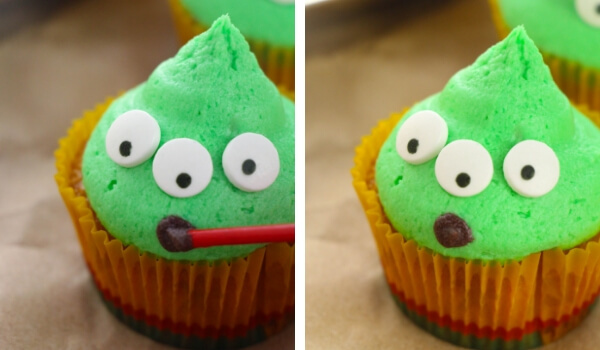 Repeat steps until all candy melt is gone. 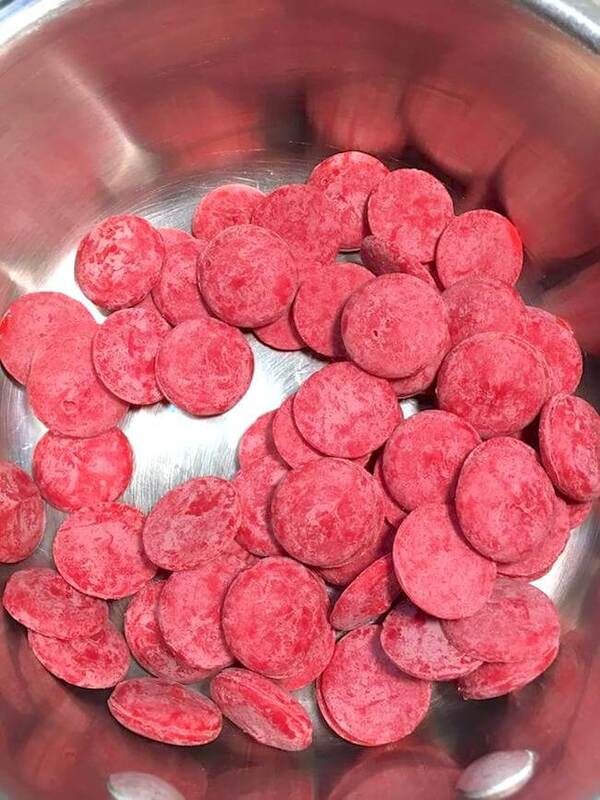 While red-coated Oreos are drying, clean out the top pot/bowl of the double boiler. 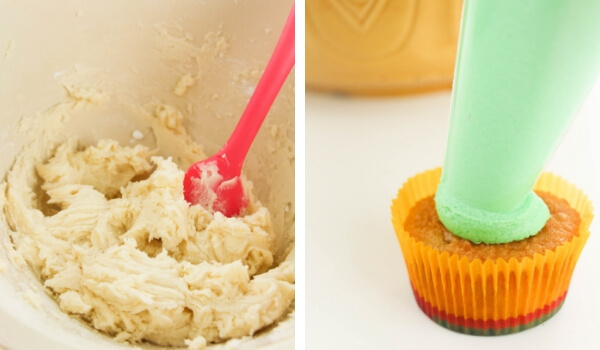 Melt yellow candy and add to piping bag. 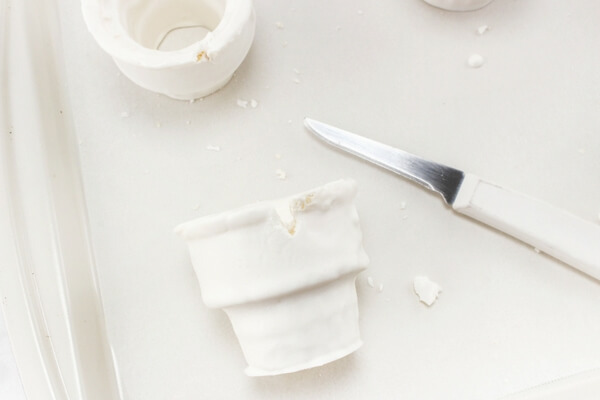 Cut tip of piping bag to allow for thin frosting. 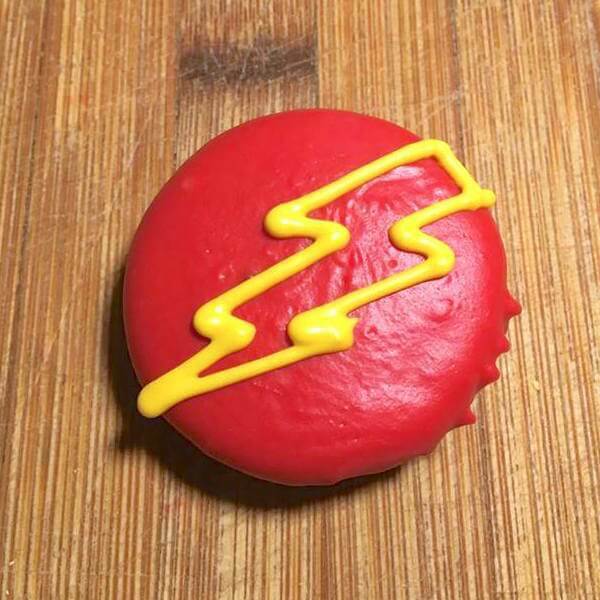 Use the piping bag to draw yellow lightning bolts on top of your red Oreos. Allow Oreos to rest until chocolate has completely hardened. Enjoy! Once red chocolate is melted, it's time to dip your Oreo cookies. 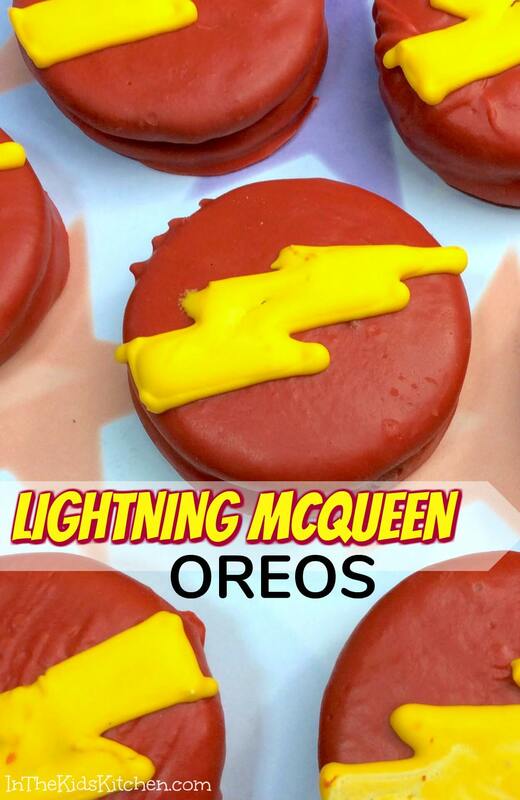 Place an Oreo in the melted red candy and turn with a fork to coat the entire surface. 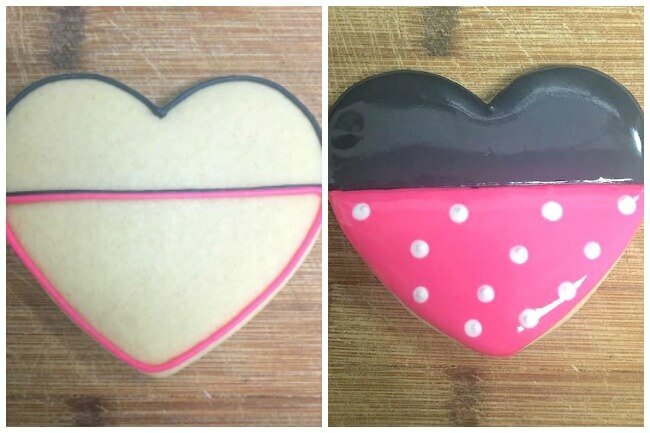 Remove cookie from chocolate, allowing excess chocolate to drip back into the bowl, and place on cookie sheet. 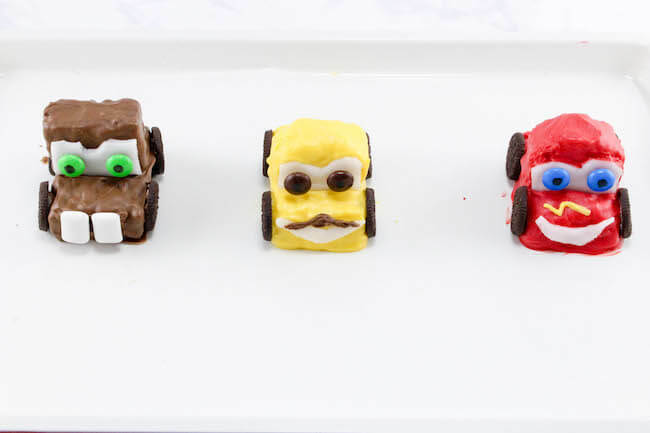 These clever Cars Rice Krispie Treats are sure to be a hit with your little race car driver! 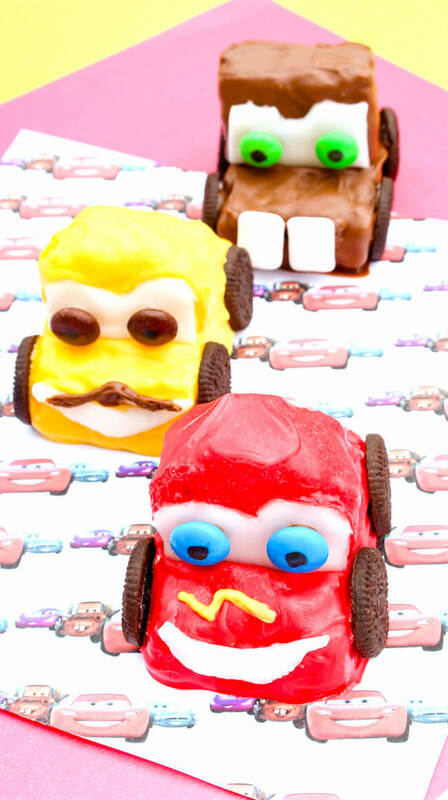 Are you excited about the release of Cars 3 too? 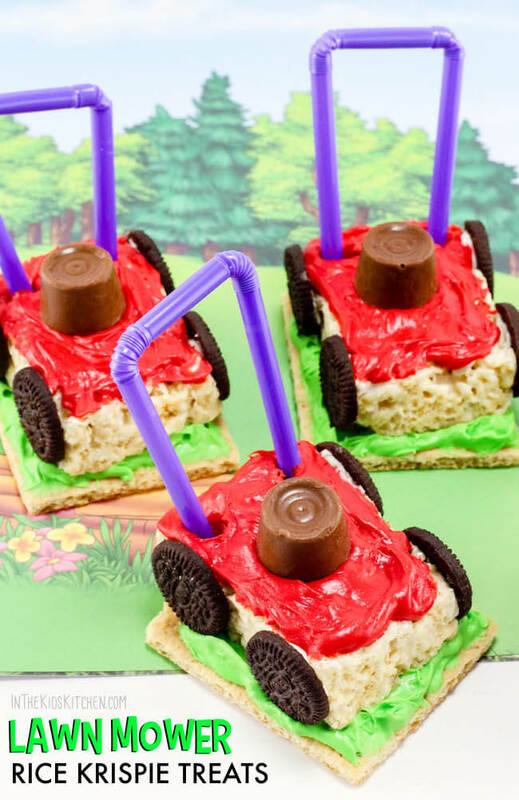 These Cars Rice Krispie Treats are such cute kid-made dessert that’s perfect for movie night or for a Disney Cars themed kids birthday party. Place 6 whole Rice Krispie Treats on a baking sheet lined with parchment paper or a non-stick silicon baking mat. 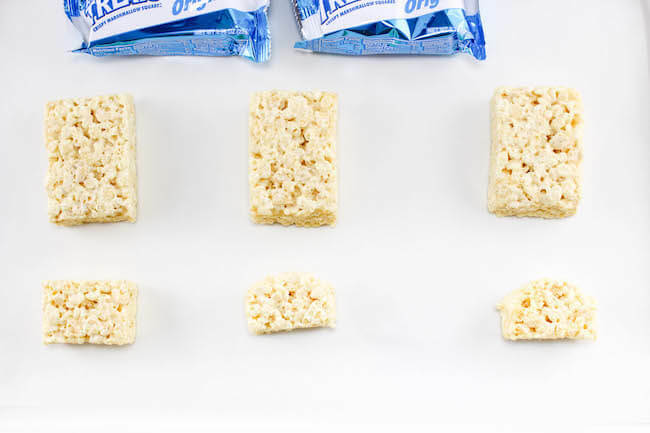 Cut another Rice Krispie Treat in half and place these pieces on the baking sheet. Cut two more Rice Krispie Treats into thirds and place those pieces on the baking sheet as well. 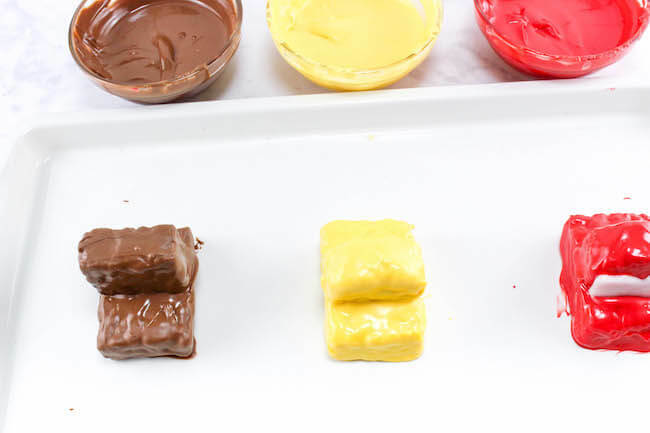 In 3 separate microwave-safe bowls, melt each color of chocolate. Heat for 30 seconds at a time, stirring between times, until completely melted. Dip 2 whole Rice Krispie Treats into the milk chocolate until fully coated. Place back on the baking sheet to dry. 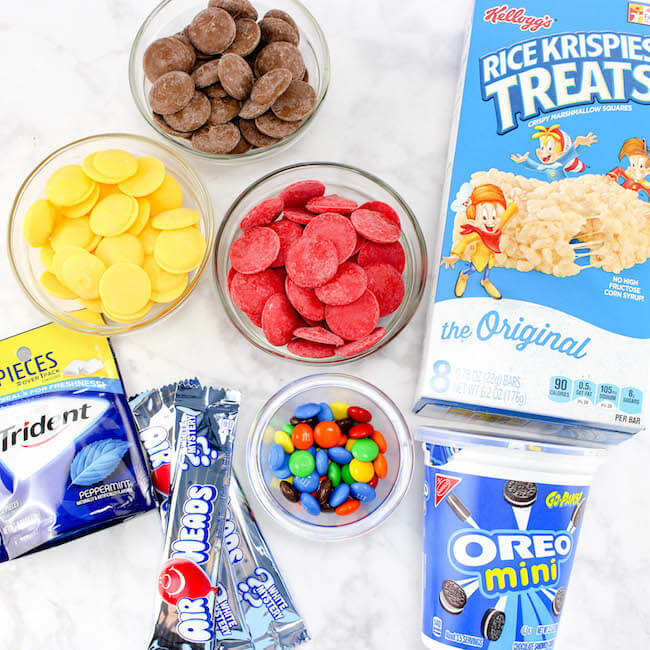 Now dip the two half-sized pieces of Rice Krispie Treats into the milk chocolate. Place one half-sized piece on top of each whole chocolate-coated Rice Krispie Treat to resemble a truck cab/windshield. This will be Mater (makes two). Next, dip 2 whole Rice Krispie Treats into the red chocolate until fully coated. Return to baking sheet. Now dip four 1/3 sized pieces of Rice Krispie Treats into the red chocolate. 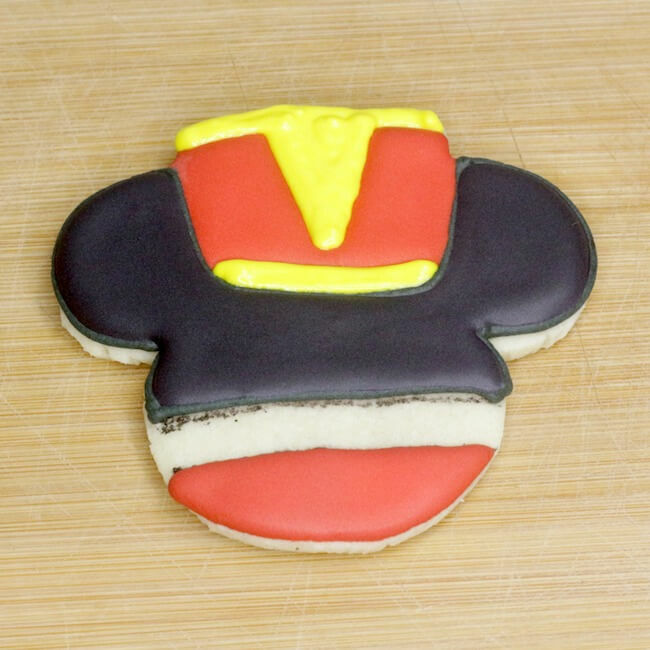 Place two of these 1/3 sized pieces on top of each whole red-coated treat to form the cars. 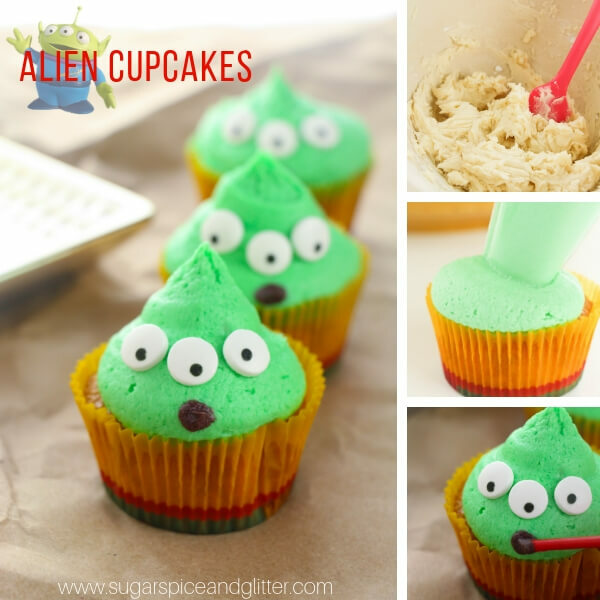 These will be Lightening McQueen. 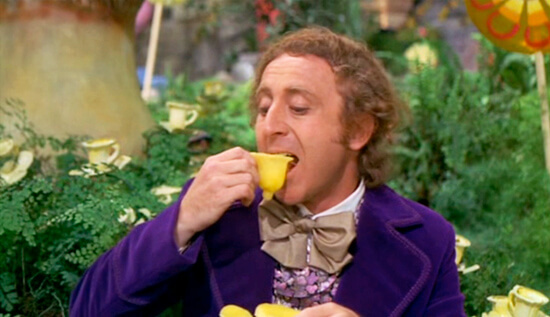 Repeat this process with the yellow chocolate to make Luigi. You should now have two of each Cars character. 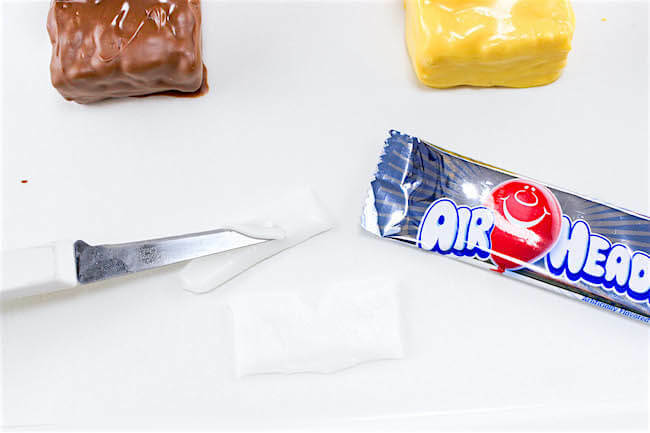 Using the Airheads candy, cut windshields to fit onto the cars. 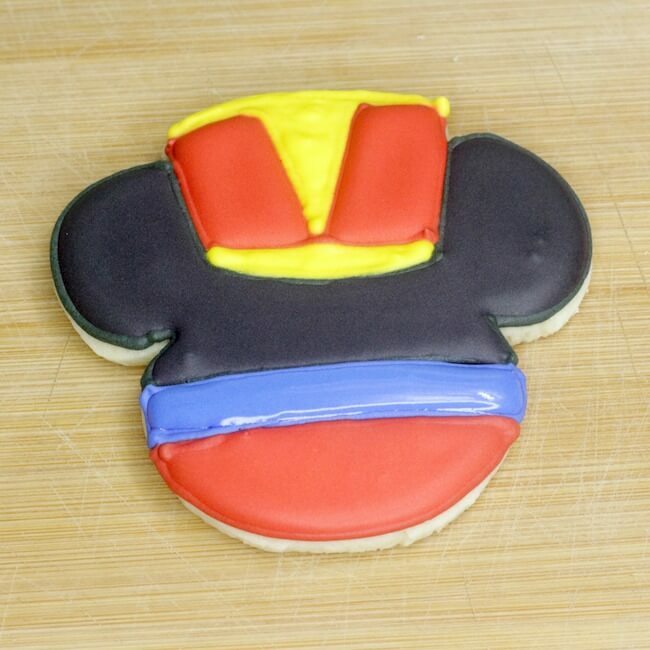 I made mine rectangle with little cut outs at the top to resemble the Cars characters. Press these on each car. Cut a mouth out of the Airheads candy for the red and yellow car. Press this on the bottom piece of the car where the bumper would be. 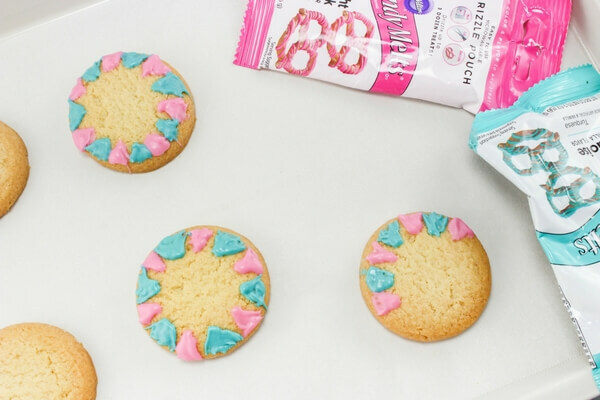 Pull apart the Oreo cookies, scraping out the filling. Press 4 cookies on each “car” to make the wheels. 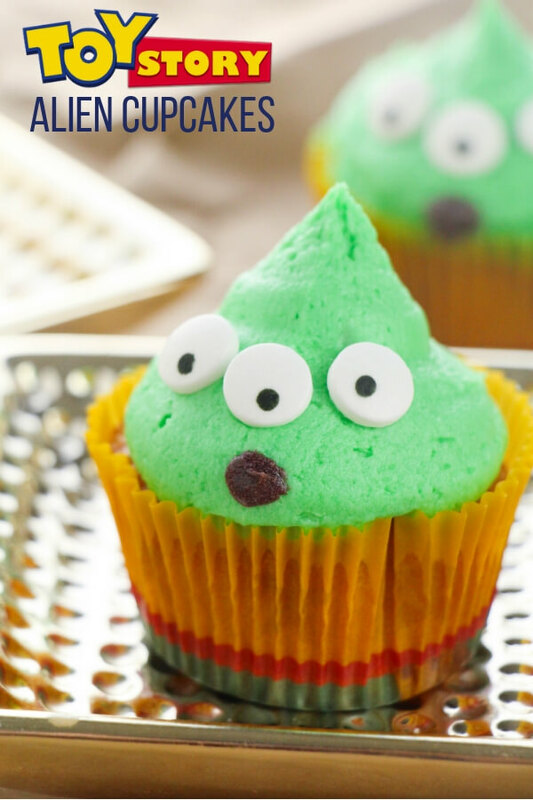 Use green, blue, and brown M&M’s for the eyes. 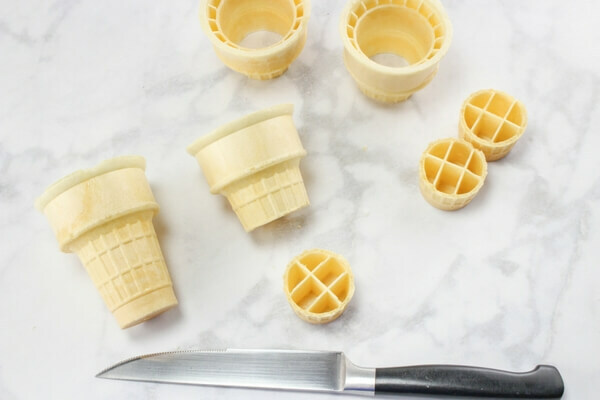 Put a dab of melted chocolate on the backs and press on the windshields. On the brown truck, put a line of chocolate on the bottom piece and place 2 gum teeth where the bumper would be. 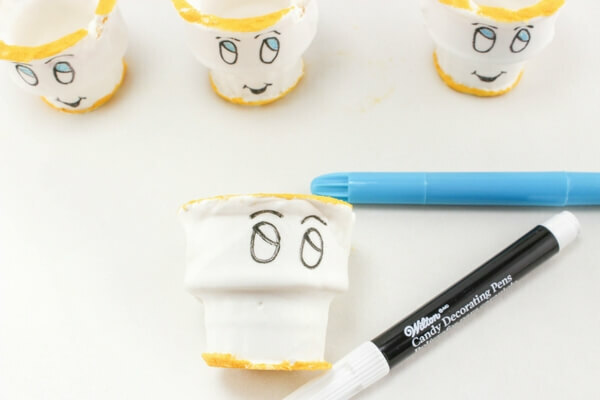 You can also pipe a line of chocolate on the yellow cars to create a “mustache” and use an marker to put black dots on the eyes. 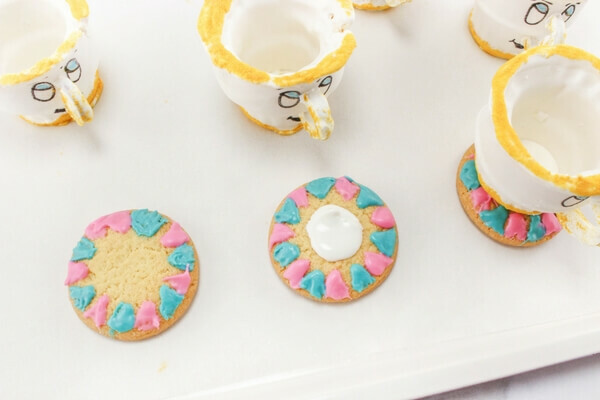 Pull apart the Oreo cookies, scraping out the filling. 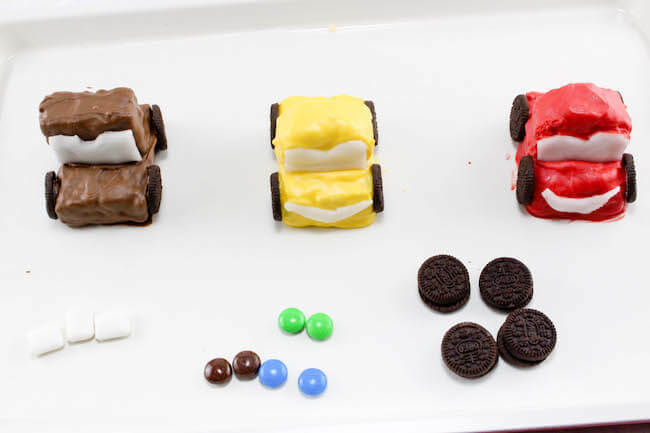 Press 4 cookies on each "car" to make the wheels. 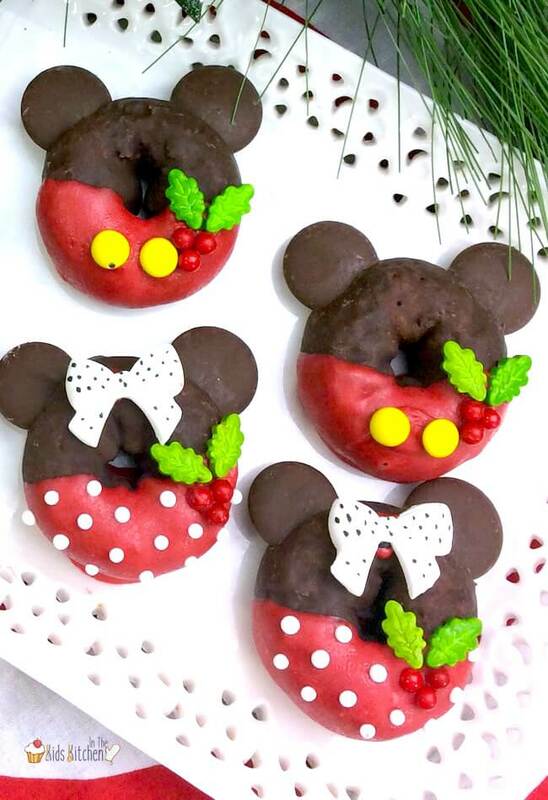 You can also pipe a line of chocolate on the yellow cars to create a "mustache" and use an marker to put black dots on the eyes. My daughter is obsessed with Disney’s Moana, and we’re looking forward to receiving our copy of the DVD sometime in the next week! 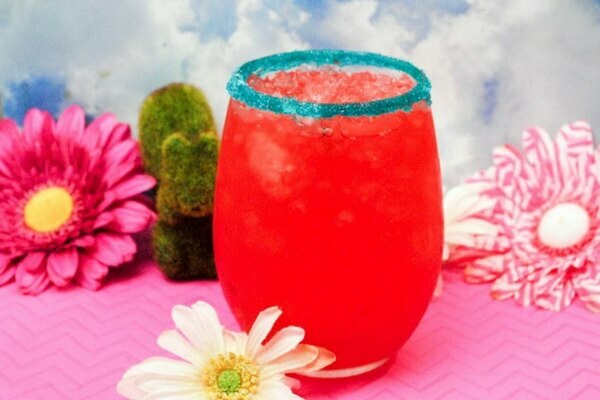 To celebrate, I created this delicious Moana Hawaiian Punch recipe to enjoy during our upcoming Moana family movie night! This recipe dresses up a traditional fruit punch with some of our favorite island flavors. 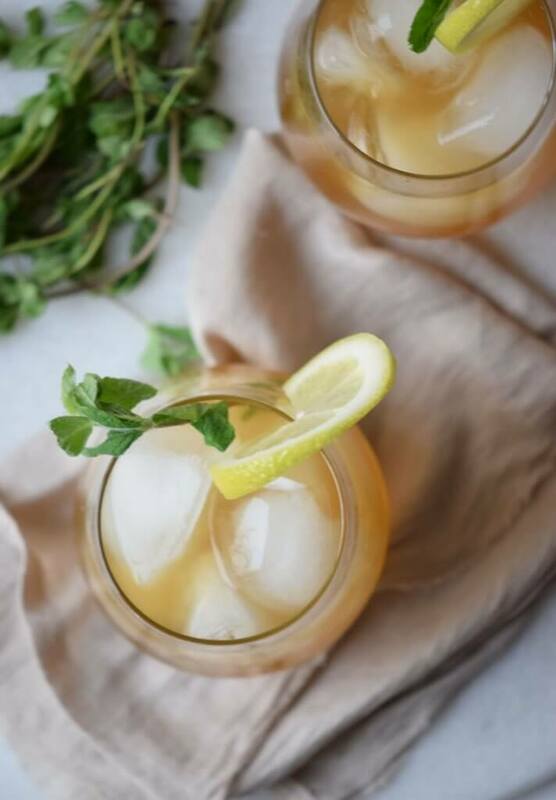 Coconut water adds a richness of flavor, and is a healthier mix-in than traditional soda-based punch recipes. I went with a red fruit punch because it reminds me a bit of Moana’s outfit, but really any berry or fruit punch can be used in it’s place. 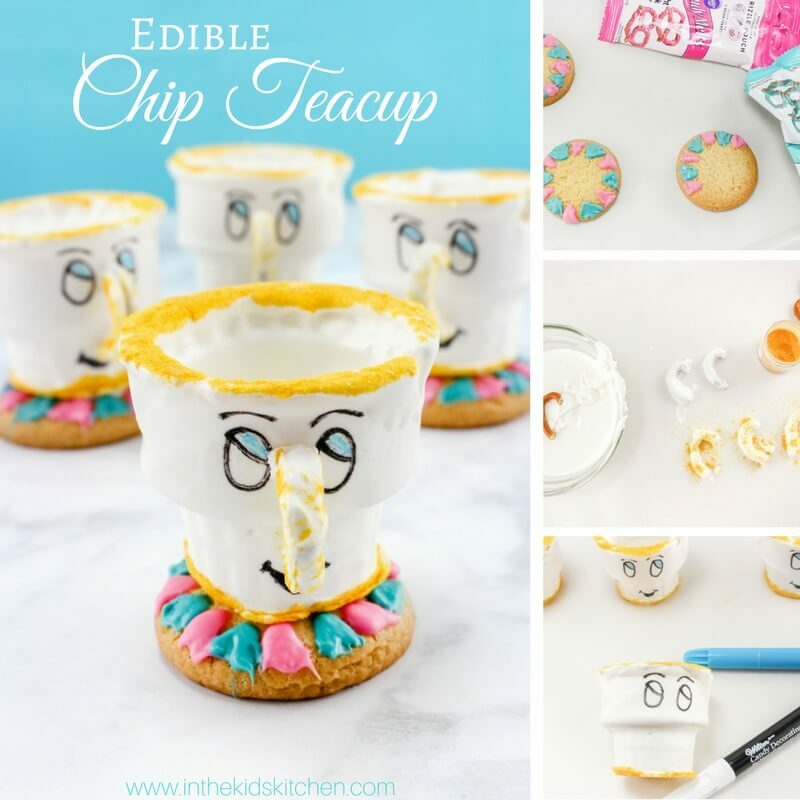 This is a fun party punch or alternative to soda, and my daughter always looks forward to these special treats on our family movie nights. 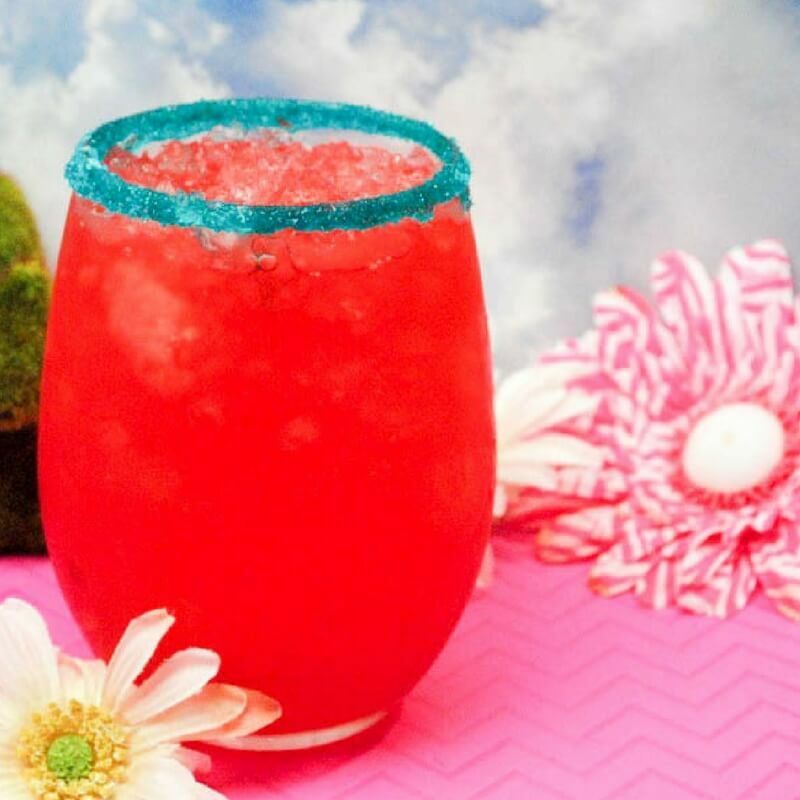 This Hawaiian Punch recipe is the perfect special treat for a family vacation or kids birthday party too. 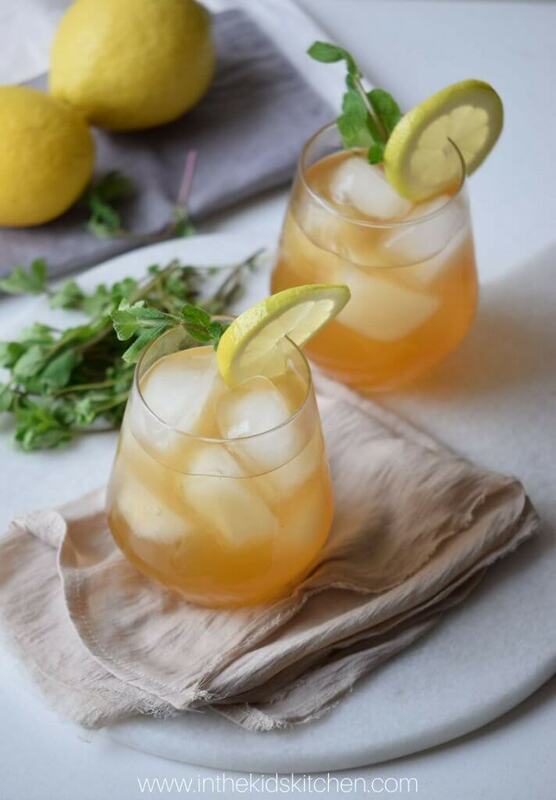 It’s one of our favorite summer drink recipes and we hope you love it too! More and more you see coconut water used as an ingredient in healthy drinks, both for kids and adults. So what’s so great about coconut water? That’s a lot of good stuff inside! Plus, coconut water may offer free radical-busting antioxidants, which help keep our bodies cells healthy. It’s an amazing hydrator – it’s my go-to way to stay hydrated when we’re travelling as air travel can really dehydrate you and it can be hard to stay hydrated with all of the TSA rules around bringing water bottles on board. I can usually find a coconut water somewhere in the airport, or at least grab one on the way to the hotel. 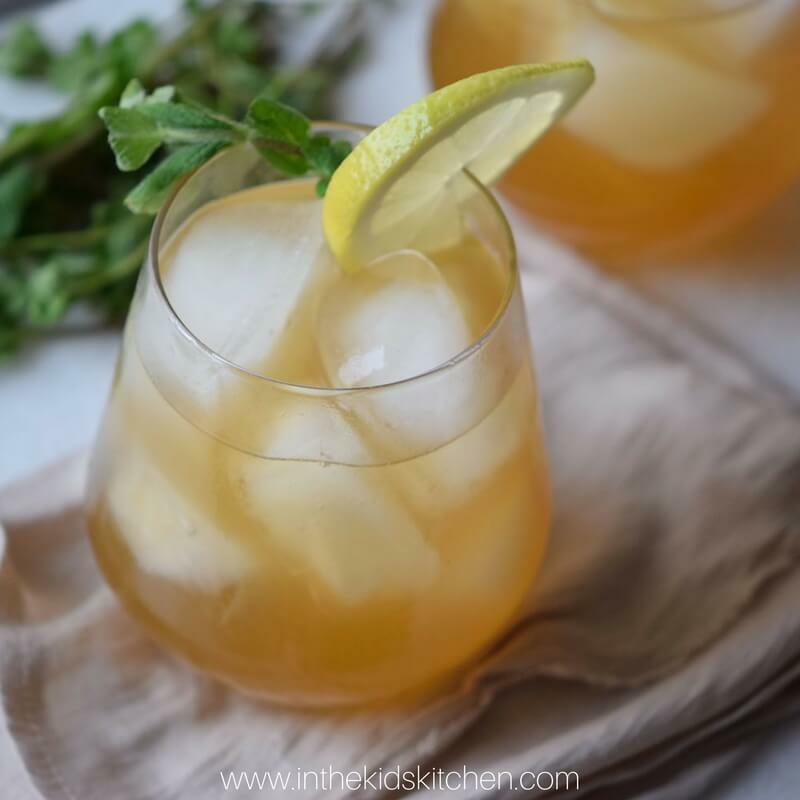 My daughter likes coconut water in recipes but doesn’t really enjoy it on it’s own – so we like to mix it into drinks, like this one! 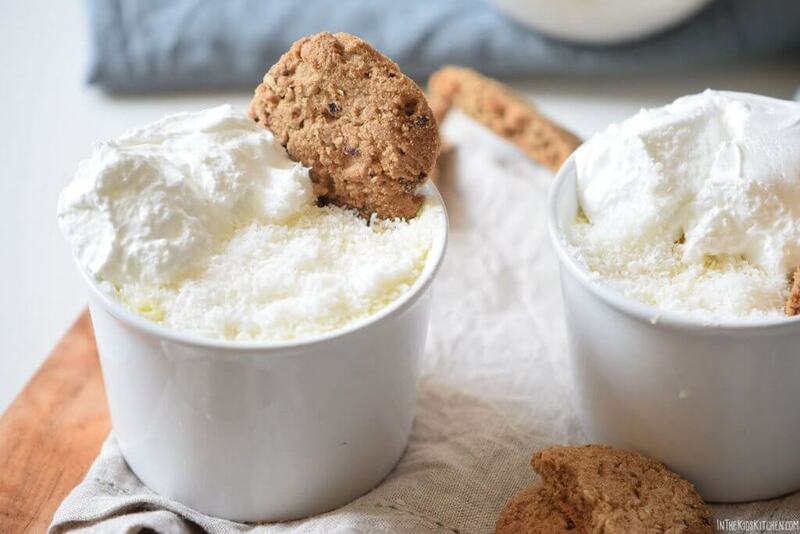 Coconut also provides a more complex flavor, and a hint of tropical taste that makes this recipe — it’s fun AND healthy! 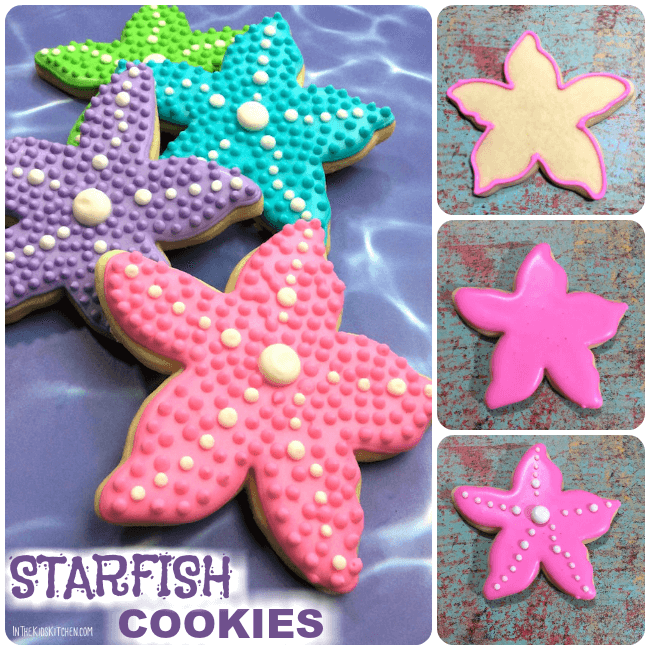 Watch this 1-minute video demo to see how it’s made, then keep reading for step-by-step instructions and prep tips. 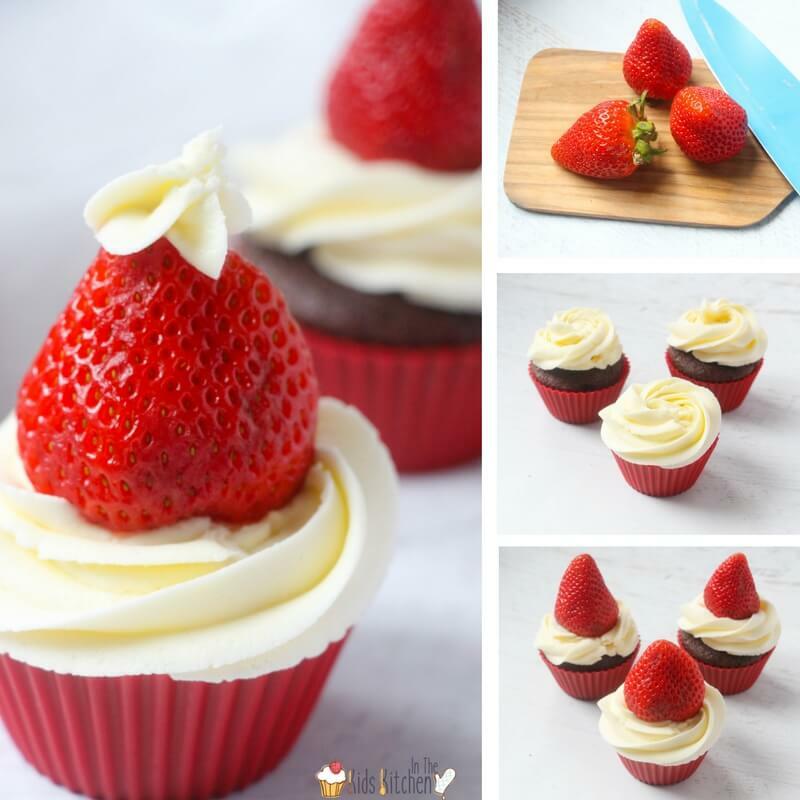 A free printable copy of this recipe available at the bottom of the post. Pour simple syrup on one plate and on the other plate pour the teal sanding sugar. Dip your glass in the simple syrup first then into the sanding sugar. Set to the side and allow to dry as you prepare your fruit punch. In a cocktail shaker combine coconut water, fruit punch, and mango juice and shake vigorously for about 5 full seconds. 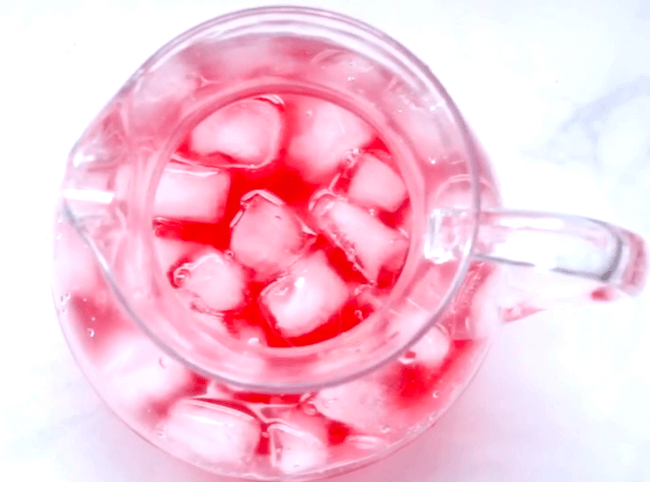 Pour shaken punch over a glass full of ice. 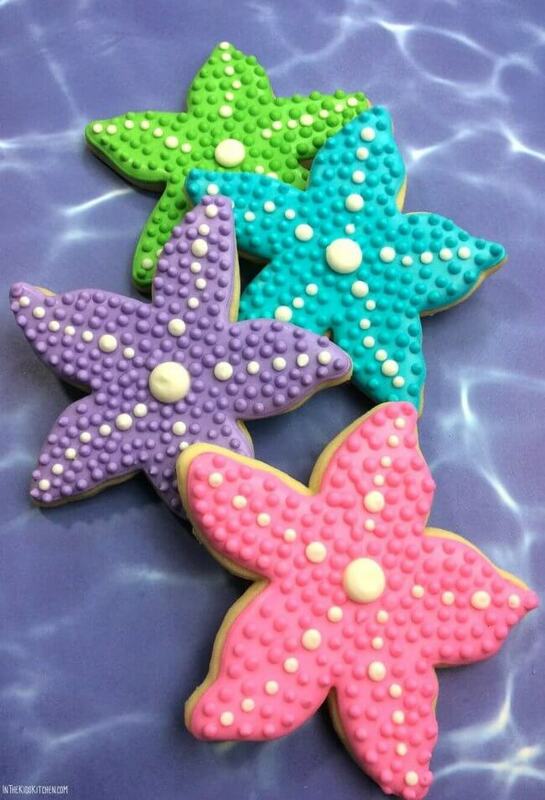 Bright, fruity, & festive! 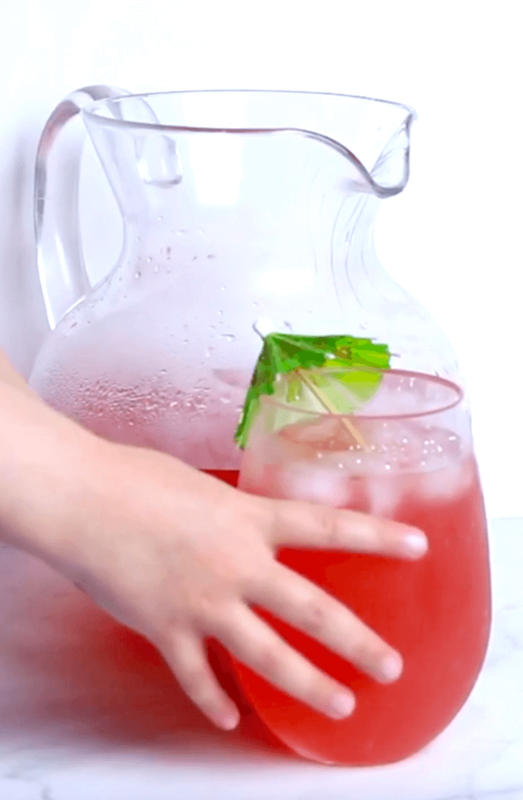 This Moana inspired Hawaiian Punch Recipe is the perfect drink for your next family movie night or kids birthday party! Set to the side and allow to dry as you prepare your Island punch. Using a cocktail shaker add your 2oz of the coconut water, fruit punch, and mango juice and shake to combine. 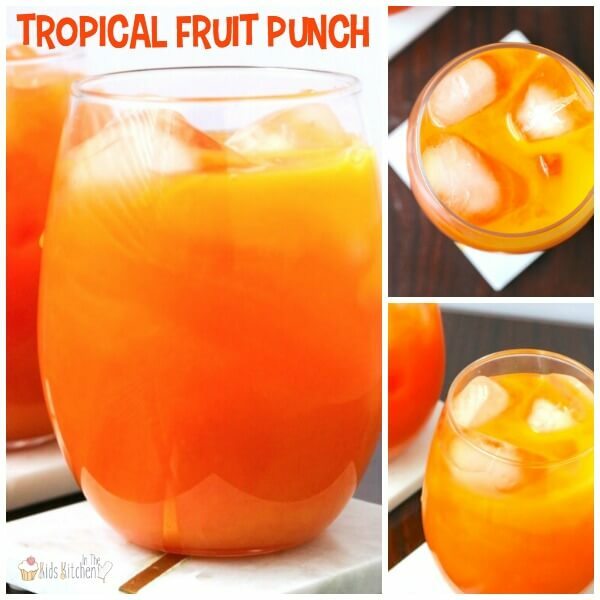 Fill each glass full with ice and top with the island punch mixture. 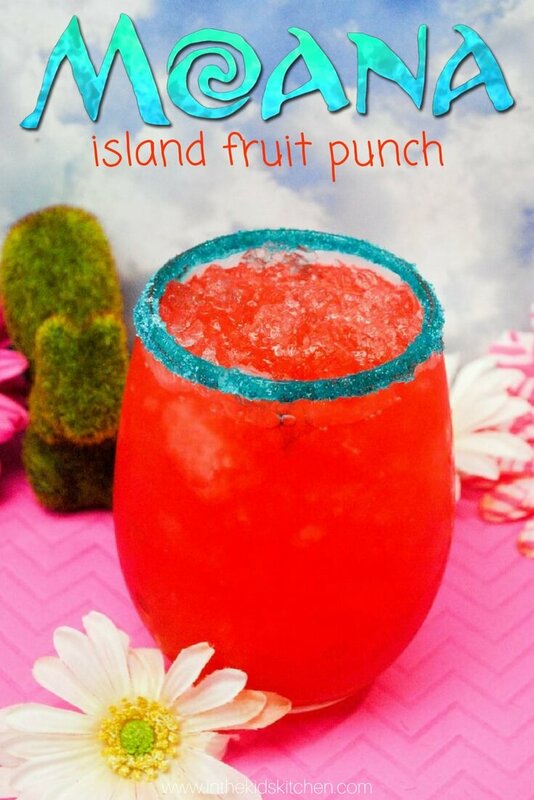 This Moana Island Fruit Punch is a cute addition to a family movie night and would be great at any summer-themed kids’ party! 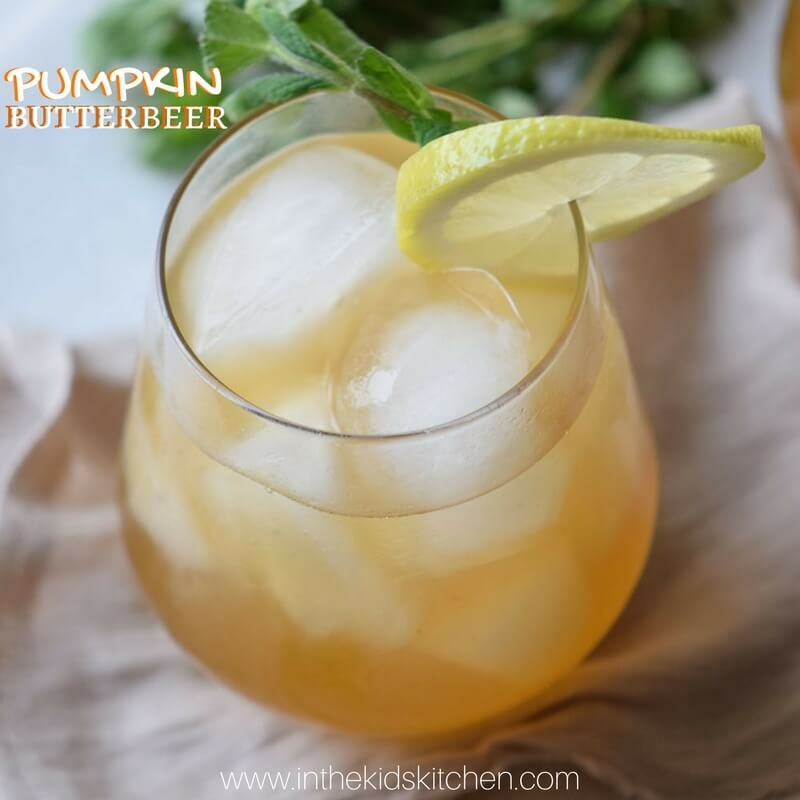 You might also love our 3-Ingredient Tropical Fruit Punch and our version of Harry Potter’s Pumpkin Butterbeer! 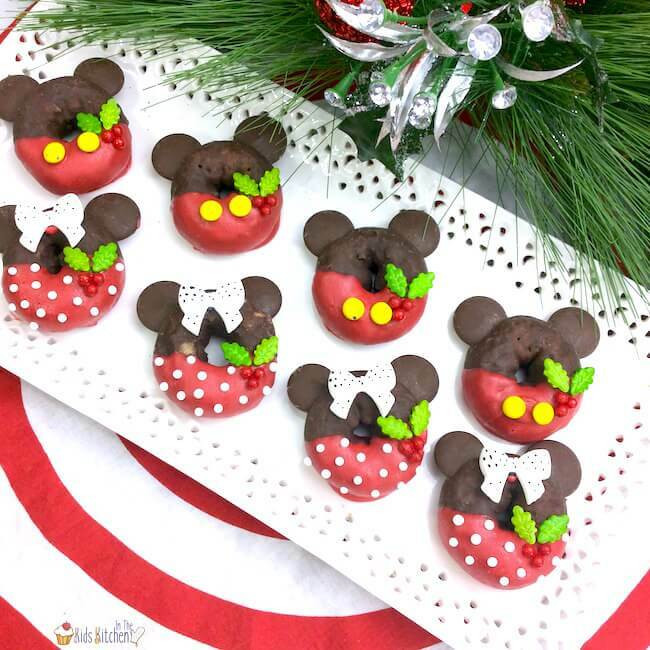 What’s inside: Easy layered fudge recipe perfect for a Mickey Mouse party! 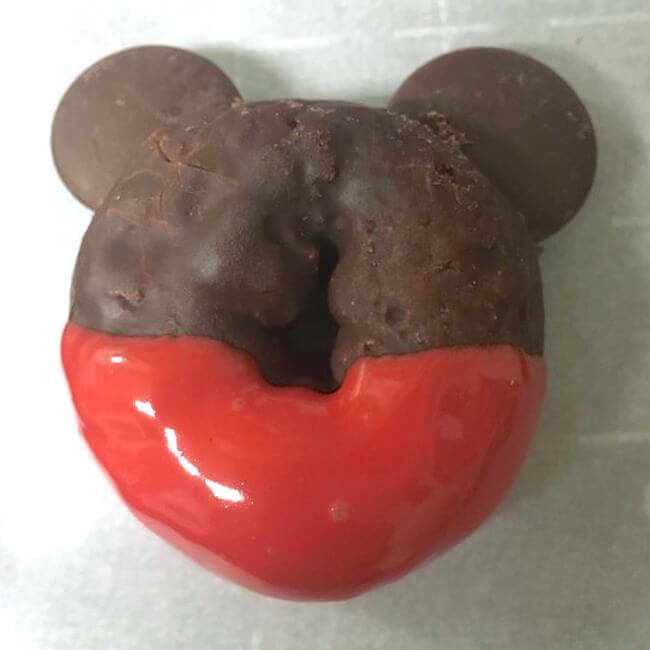 Guests, both young and old, will get a kick out of this cute and colorful Mickey Mouse-inspired fudge recipe! 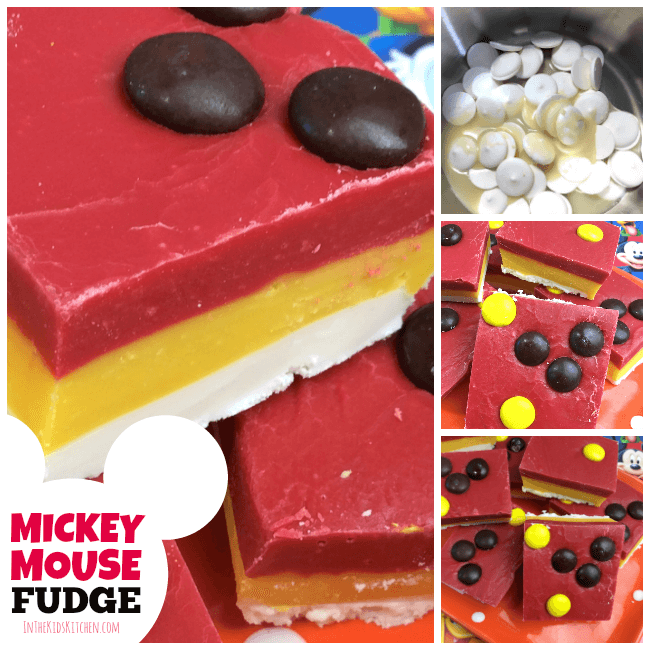 Red, yellow, and white layered fudge decorated with Mickey Mouse ears perfectly complements a Disney-themed or Mickey Mouse birthday party. 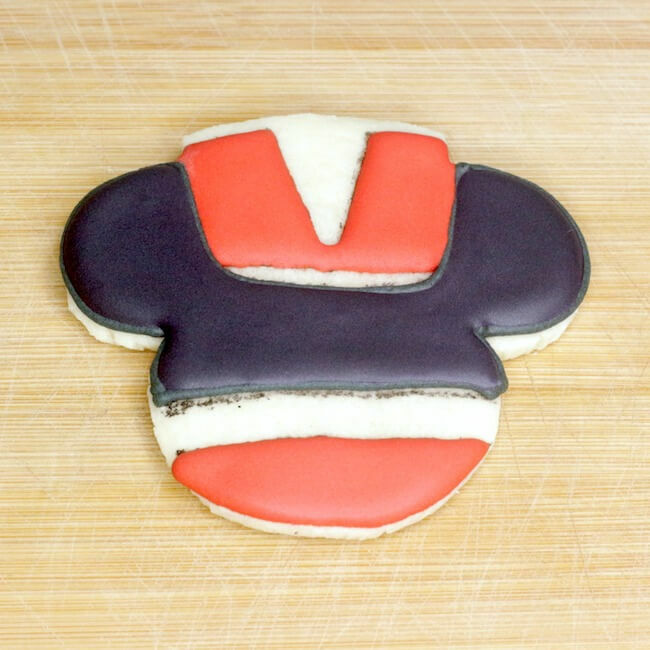 This is such an easy dessert to prepare, and one that kids can help with (they’ll especially love making Mickey Mouse out of M&Ms!) 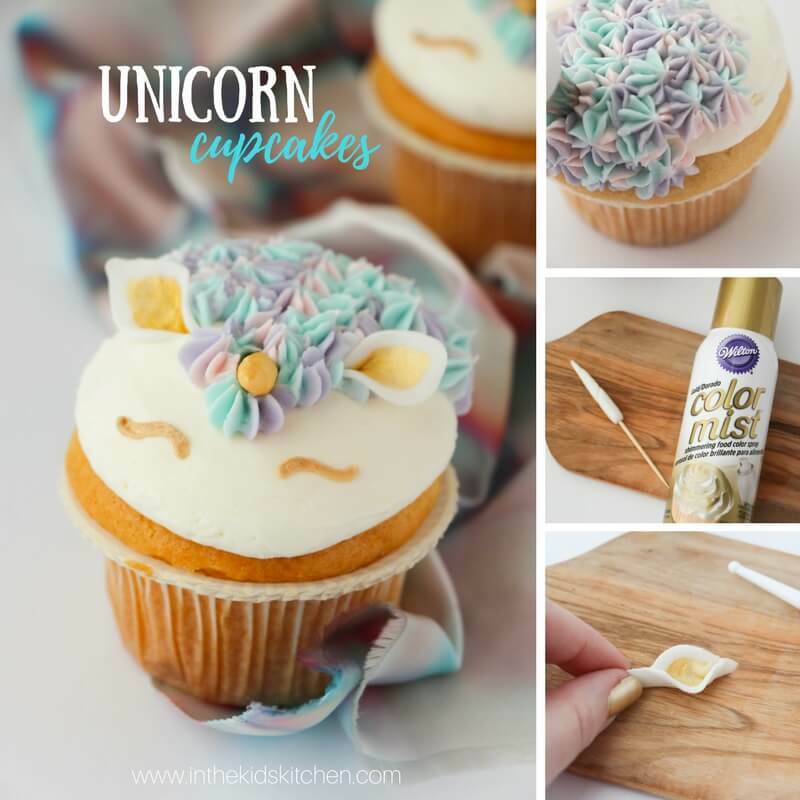 It’s a simple recipe with common ingredients, but it will look like you put lots of effort into it. 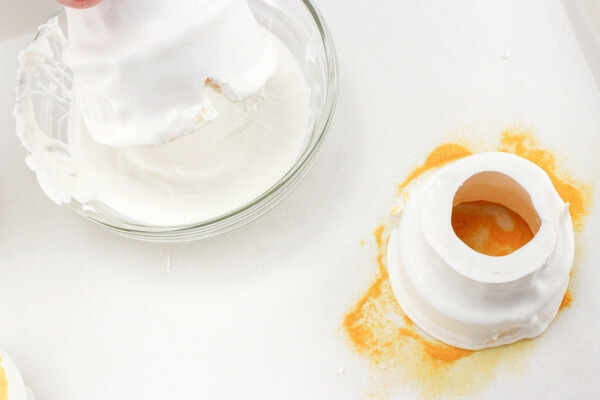 Place a sheet of parchment paper in an 8×8″ baking pan and coat with cooking spray. 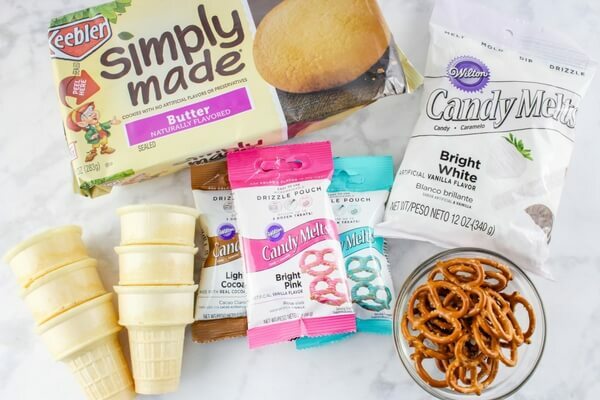 In a medium sauce pot, combine the white candy melts and 6 tablespoons plus 2 teaspoons condensed milk. Cook over medium heat, stirring regularly, until completely melted and smooth. Pour white fudge into the pan and let it set for 15 minutes before adding the next layer. 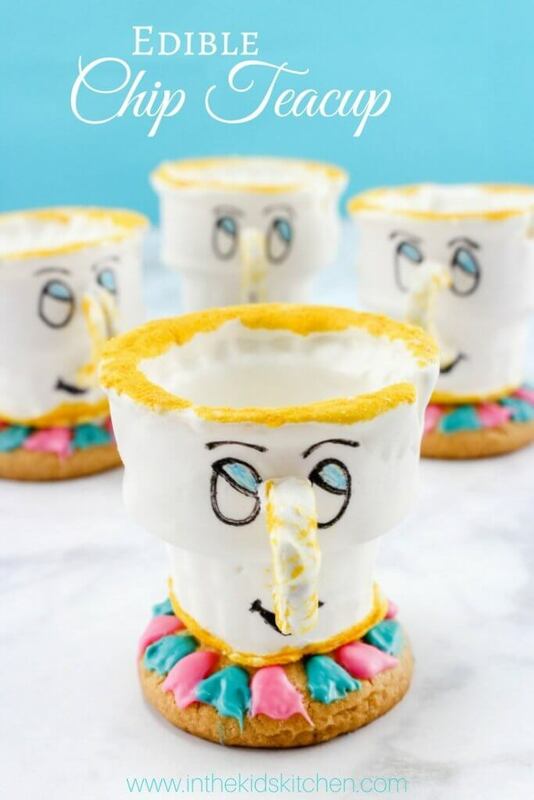 Using the same medium size pot (after its been cleaned), combine the yellow candy melts with 6 tablespoons plus 2 teaspoons condensed milk. Cook over medium heat, stirring regularly, until completely melted and smooth. 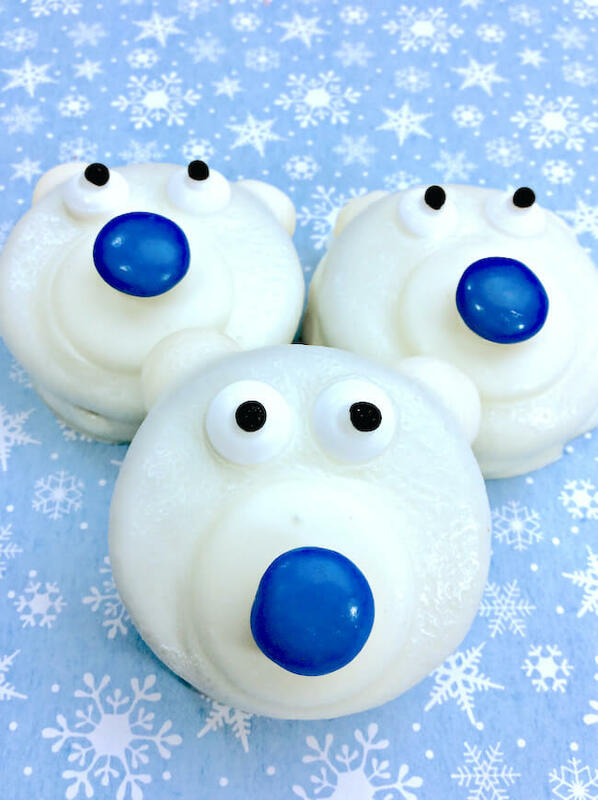 Pour red fudge into the pan on top of the white fudge and let set for 15 minutes before adding the final layer. 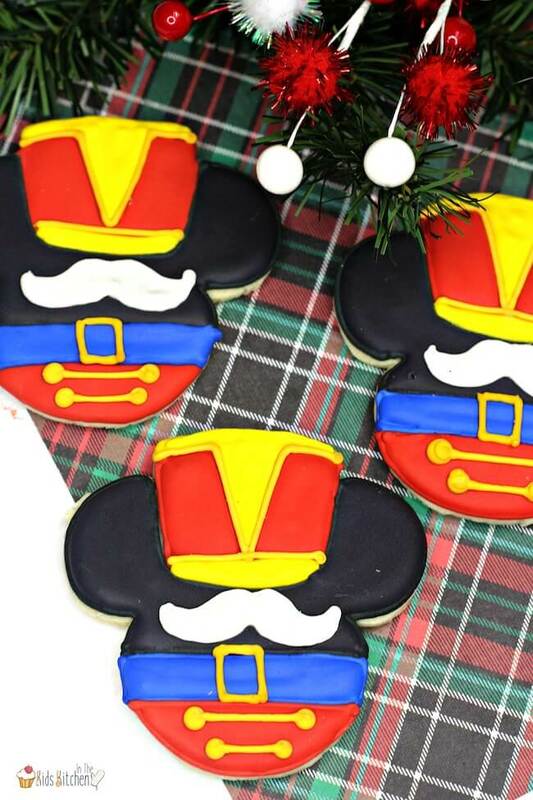 Repeat the cooking process above with the red candy melts. Allow to set at least 15 minutes before placing M&Ms. 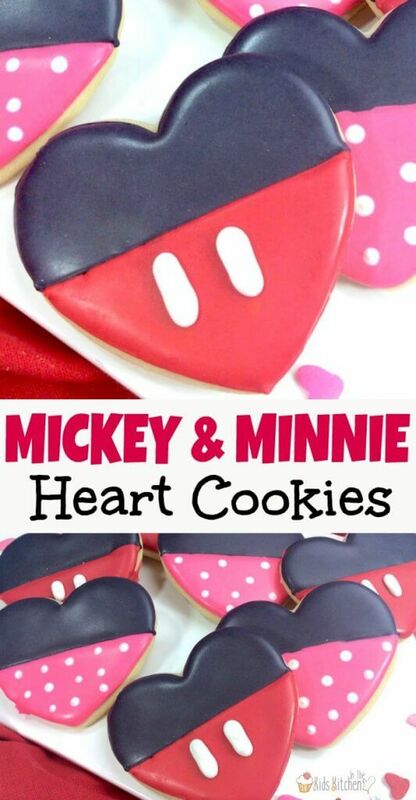 Use brown M&Ms to make the Mickey head: one M&M in the center and one on each side to make the ears. Repeat this as many times as you’d like across the top of the fudge. 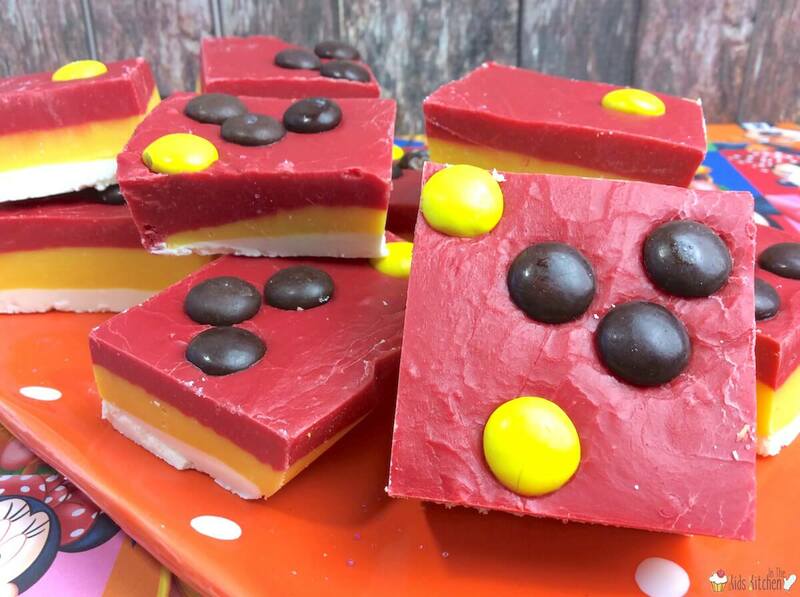 Scatter yellow M&M’s around the top of the fudge, gently pressing each one into the fudge so it will stay in place. 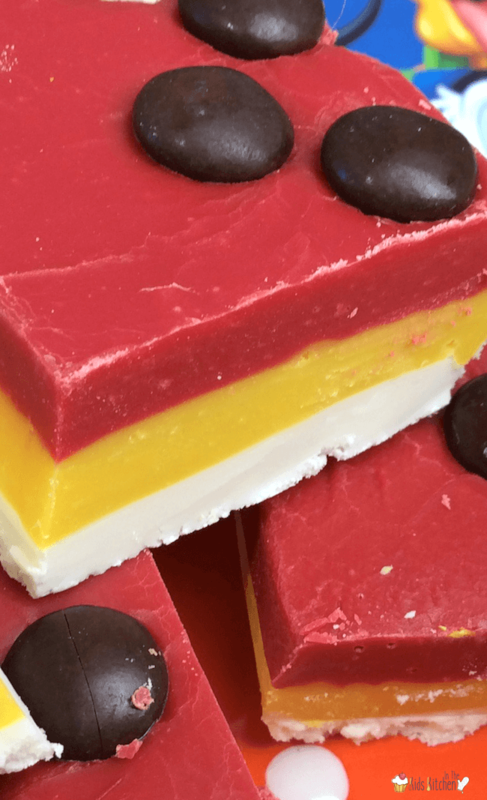 Allow fudge to set in fridge for 1 hour before cutting. 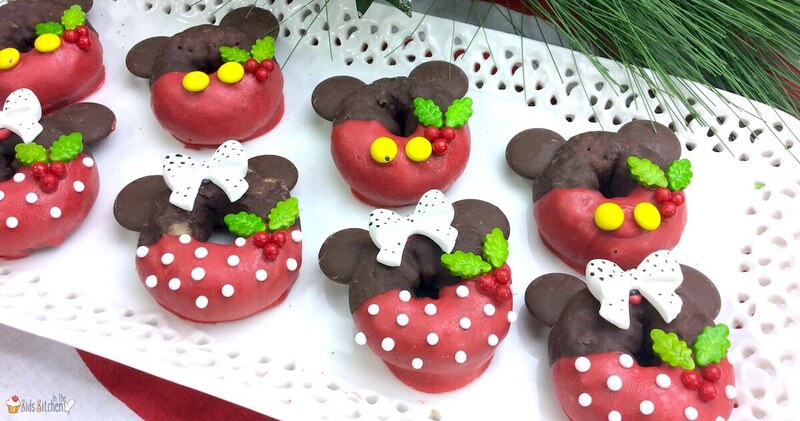 TIP: Swap yellow melting chocolate for pink and you’ve got an adorable Minnie Mouse layered fudge instead! 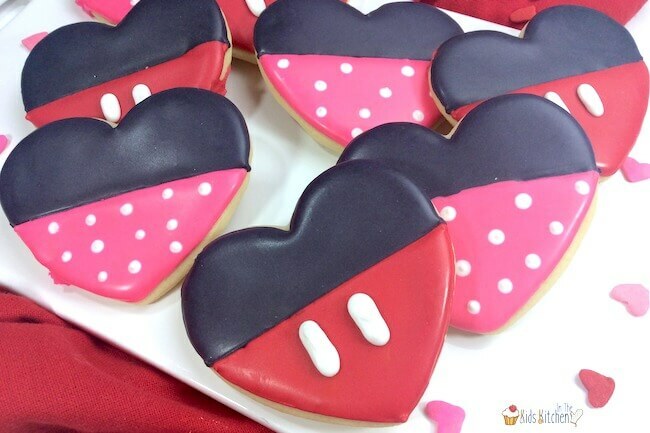 Perfect for your thrifty Minnie Mouse birthday party!